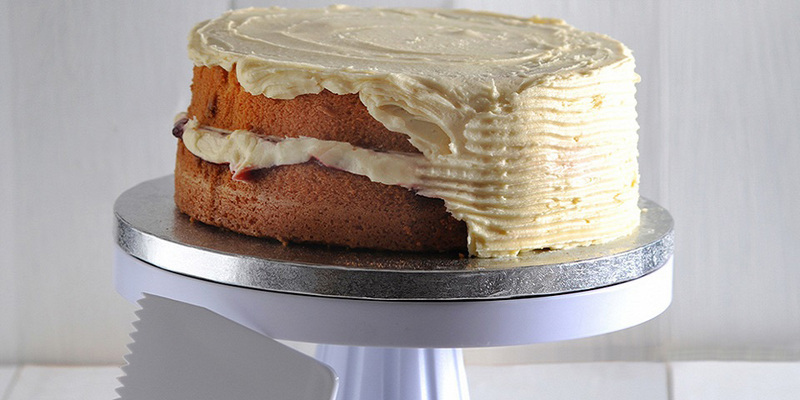 The Mason Cash cake decorating turntable makes cake, pie or flan creation simple. The smooth rotation allows for free flowing piping or smoothing and circular markings is ideal for centering the cake. Strong and lightweight, the raised platform offers easier access. Place a marzipan covered cake on a cake drum in the centre of a turntable. Put a large drop of royal icing in the centre of the cake. Cover the remaining icing so it does not dry out. Use a palette knife to spread the icing evenly over the top of the cake. Paddle the icing back and forth whilst revolving the turntable to remove air bubbles. Lightly pull the straight edge across the cake at a 45-degree angle. Draw it towards you in one continuous movement. Clean the straight edge. Remove any extra icing from the cake with the palette knife. Set the cake in a dry area. Let the frosting harden for at least 2 hours. Spread icing on the sides of the cake with the palette knife. Paddle back and forth to remove bubbles. Clean the knife. Hold the knife at 45 degrees to smooth the edges of the cake. Revolve the turntable while scraping the sides with the knife. Remove excess icing. Clean the knife. Set the cake in a dry atmosphere to harden overnight. Store icing in an airtight container. Repeat the icing steps adding at least three more layers to the cake. Gently place the cake on a cake drum on the turntable. Fill a food piping bag with buttercream icing and twist the top end of the bag. With one hand near the piping tip and the other hand near the twisted end of the bag, squeeze buttercream from the piping bag onto the top of the cake until covered. Spread the buttercream with a spatula to ensure even distribution. Next, apply the buttercream to the sides of the cake with the piping bag and once covered, smooth with a spatula, whilst revolving the turntable. Allow the buttercream to dry for approximately 15 minutes. The icing is dry when it begins to crust. Touch the icing with your fingertip. If the icing sticks to your fingertip, it is not yet dry. Top Tip: Place a paper towel on top of the buttercream icing after it has dried. Using a cake scraper, gently scrape the top of the paper towel in long strokes. This smoothes the frosting without leaving any marks. Place a new paper towel on the side of the cake, and continue scraping until the sides are also smooth. Care & Use: Wipe with warm soapy water before first use and after every use. Do not immerse in water. Not suitable for dishwashers. Do not use with sharp or abrasive tools.